On the weekends, I’m inviting some of my crochet, knitting, and crafty friends for a takeover of my Instagram account so they can share their talents with you. Since you can’t easily share links on Instagram, afterwards, I share a roundup including links to all the patterns and projects featured in the takeover. So, are you ready for the latest #undergroundcraftertakeover roundup? This week’s guest is crochet designer Heather Anderson from The Unraveled Mitten. You can also find Heather on Facebook, Instagram, Pinterest, and Ravelry. All photos are copyright The Unraveled Mitten and are used with permission. Photos are displayed clockwise from top left. Heather says, “This is the May Flowers Granny Square that I came up with one super rainy April day… April showers bring May flowers! I love this Cultivate Joy plaque, I mean after all is that not what crochet does? It brings joy to not only the maker but the person who receives it as well.” Get the free crochet pattern for the May Flowers Granny Square here. Heather says, “I love to learn new crochet stitches. It is my favorite way to get inspiration for new project. Quite a few of my patterns came about because I wanted to put a new stitch I learned into action. This is the Tulip Stitch. I love the subtle texture it creates and it makes its own little scalloped border. It is a great one for baby blankets!” Get the free crochet pattern for the Tulip Stitch here. Heather says, “This is one of those patterns that came about by learning a new stitch. The Neapolitan Slouchy Hat (named after my love of ice cream of course) uses the Quick Shell Stitch, an easy stitch that creates a lovely eyelet type fabric.” Get the free crochet pattern for the Neapolitan Slouchy Hat here. Heather says, “The Spacey Chevrons Cowl was one of the first patterns I actually put down on paper. I could crochet this one in my sleep, I’ve made so many. It is one of my favorite to wear and I have them in multiple colors. It is your not-so-basic-everyday accessory. You can find this easy, beginner friendly pattern on my blog.” Get the free crochet pattern for the Spacey Chevrons Cowl here. 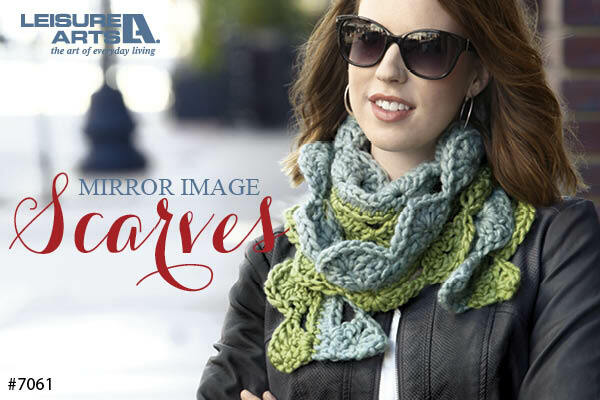 Heather says, “Sometimes designs are all about the yarn… this is the Spring Fling Triangle Scarf. It has a very basic half granny square shape but by using this GORGEOUS sparkle sock yarn, it elevates it into something that isn’t just your average scarf.” Get the free crochet pattern for the Spring Fling Triangle Scarf here. Heather says, “Quick projects are my favorite things to make and bonus point if it only takes one skein! This Messy Bun Ear Warmer is just that. This took me less than an hour to make and only used maybe a ¼ skein of yarn. It’s a great way to use up those partial skeins taking up precious yarn real-estate in your stash.” Get the free crochet pattern for the Messy Bun Ear Warmer here. Heather says, “My current project is a couple of toss pillows for my living room. I chose these colors because they remind me of the Great Lakes. I grew up about 20 miles from Lake Michigan and now live in a small beach town along Lake Huron. I will be releasing this pattern in parts over the next couple weeks. You can keep up to date by signing up for my FREE weekly newsletter on the blog.” You can find the first part of the Lakeside Crochet Pillow Collection here. Heather says, “This is the Very Berry Baby Blanket made using Bernat Pop yarn. The optical illusion created by this combo of single and double crochets is so neat. I love when the simplest of stitches can be put together into something that looks more complicated than it really is…. And how about that ruffle? !” Get the free crochet pattern for the Very Berry Baby Blanket here. Heather says, “I hope you all enjoyed this takeover as much as I did. It has been fun sharing my patterns and design processes with you. I am going to leave you with one final pattern. This is the Barn Quilt Inspired Wall Hanging. It is a modern take on the classic half square triangle quilting technique and is a quick project with a big impact.” Get the free crochet pattern for the Quilt Square Inspiring Wall Hanging here. Thanks so much for visiting with us this, Heather. Follow @ucrafter and @theunraveledmitten on Instagram for more crochet inspiration!